you’d think from watching kelo that the flood begins at pierre and ends at dakota dunes. screw everything in between and beyond. Development down and next to the river was based on 100 year flood plain potential. Seems an appropriate guideline. What’s happened is the exception. Not that I’m religious but more an ‘Act of God’ than policy flaw. The public can offer help but the general population is not responsible for those who built low. There’s no indication of just how bad the flood will be. 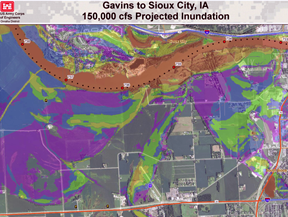 Considering present predictions error, I fear levees will not hold and most areas will be lost. The rich will not need FEMA trailers and they shouldn’t get a check. The poor may have better housing than before and there’ll be lots of federal help with excess or recycled homes/material/MRE’s headed to reservations where it is desperately needed. PL – You may be right, maybe this is a blessing in disguise? PL – If I’m not mistaken, the levels of flooding that will be reached ARE all within the 100-year event plain. Development has encroached into that plain BECAUSE the dam system was supposed to prevent it from EVER happening. The “exceptional” element to this particular event is that it is being viewed as a 500-year flood. As I’ve said in another conversation – Welcome to the relaity of global wetting. I guess the private homeowners built their own dikes, that is why the Guard has to drop sandbags by copter because they cannot drive over the private dikes. No FEMA for you. Srsly. Here’s the lifestyle you’re subsidizing. Levee building and sandbagging to protect riverside swimming pools. These are the same federal welfare queen hypocrites who curse the “gubermint” in nearly every breath. For a “master-planned” community the so-called planning that built Dakota Dunes into two flood plains (Missouri and Big Sioux Rivers) was breath-takingly stupid. The mission of the dams is flood control – not flood prevention. Building and permitting building in the flood plain is stupid is, stupid gets. This is a man-made disaster. It would hardy be a story if there was no building in the flood plain. Flooding in a flood plain is a question of when; not if. Yes, Dakota Dunes is indeed a bastian of right-wingedness – and of the associated moral hypoocrisy. J2 – that picture is priceless. Yeah, building a home on a floodplain is kinda stupid. Your morons. Regular peoples homes are being flooded because the dam was not opened much earlier. When you come to realize it is not an us vs them thing perhaps the bitterness you call snarky will go away and you can look at issues as they truly are. I will add a friend of mines family is going to lose their home to the flooding and it is not some mcmansion. Jim – I think I was pretty clear that I don’t wish ill-harm on anyone, even the working class citizens that will be affected, but the working class citizens won’t be the ones bitching about their taxes when the National Guard and FEMA come to help, it’s the people who own the McMansions in the gated community of Dakota Dunes.